Jude Wanniski's "Two Santa Claus" theory of Republican tax cuts and Democratic spending programs as being the political parties' Christmas gifts that stimulate the voting in their respective directions has a corollary in HiFi: The "Looney Tunes and Merry Melodies" theory of yours truly. It says that new products with advances that appeal to those who listen for sound (the Looney Tunes), and new advances that appeal to those who listen for musicality (the Merry Melodies), tend to stimulate HiFi hobbyists to vote with their wallets. The original Absolute Sound with the excellent writing of Harry Pearson was once the preeminent tome for Looney Tunes pursuing that carrot of sound, and effectively caused a great many of them to repeatedly part with large green as new "advancements" were announced. Then Listener arose from the primordial notes, a pinnacle of achievement for the Merry Melodies. The witty and funny writing of Art Dudley got the fun back in HiFi, and got the Melodies back in touch with the music on the discs and the rhythm in their souls, while effectively causing them to part with large green as dealers got in touch with their wallets. Regardless of whether you are a Looney Tune or a Merry Melody, the 2004 Consumer Electronics Show and The Home Entertainment Show had something for everyone, and may have been the most impressive collection of products gathered together in one cartoon in the last several years. You know what that means? There's going to be an avalanche of large green in the direction of the folks that have won the minds of Looneys and the hearts of Melodies with their cool new gizmos. Being both a Looney and a Melody (actually more of a centrist), I thought it would be fun to tell you about the goodies that pushed my buttons this year, and to do a little crystal ball gazing to predict what some of the hits and new trends will be. 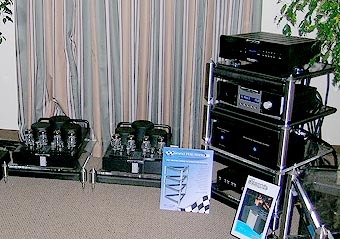 I heard so much great gear it's hard to narrow it down, and of course it was impossible to get a good listening session in every room due to the crowds. But for what it's worth, I thought I'd share some of my experiences and offer some choice picks from solid state amplification, tube amplification, digital products, a turntable or two, loudspeakers, a couple of cool new amplifier discoveries, a couple of picks for the most innovative products, and of course a "best of show" award to one lucky room. Oh yeah, they're lots of cool pics included just for the fun of it! 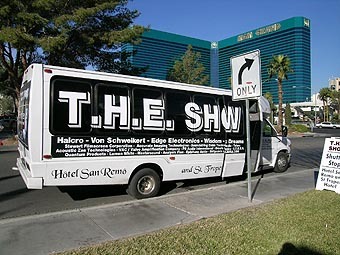 So grab a cup of Joe, jump on the bus with me, and let's go for a ride through CES and T.H.E. Show! Avantgardes can be fussy beasts to get sounding great, but Jim Smith had his Super Duos singing a siren song in the Avantgarde USA room in what was the best-ever performance I've heard from Avantgardes under show conditions, and very nearly the best sound at the shows. Avantgarde goes together with Balanced Audio Technology electronics like peanut butter goes with jelly, resulting in an expansive, warm, detailed, dynamic and musical sound. One of the strengths of this system was its ability to make even average recordings sound spectacular, an important consideration for Merry Melodies, and a hat trick only a few systems could pull off this year. The Super Duos add two extra woofer modules for a total of six dual-10" actively amplified bass arrays. This doesn't just give more bass dynamics and speed as your math of 6dB of gain from paralleling and the resultant minimized excursion would correctly predict. 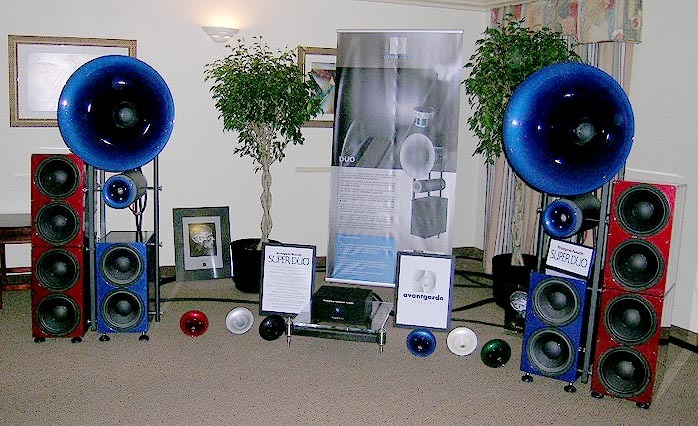 The main benefit of the extra woofers to my ears was a much greater sense of hall sound and space. 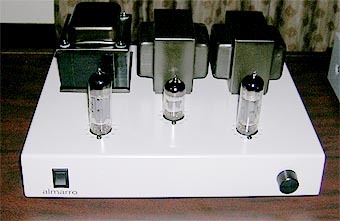 Cardas Golden Reference handled connection duties, while Running Springs Audio conditioned the power and Grand Prix Audio the bad vibes of parasitic resonances. 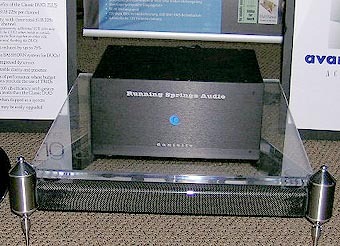 When I complimented Jim on his sound, he told me that the Running Springs Audio gear really brought everything together to give the great sound I heard in the room. Impressive. 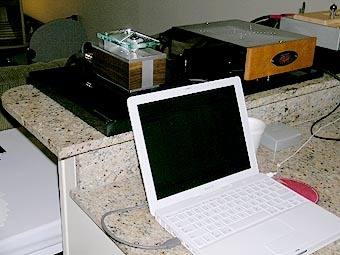 Okay, the Apple part in the room sign is a joke on my part, but the great sound of Wavelength's new $3500 vacuum tube Cosecant USB DAC [upper left below] running off designer Gordon Rankin's Apple G4 iBook laptop as a transport was no laughing matter. I was so impressed that I hereby award Gordon the Digital Product of CES Award. 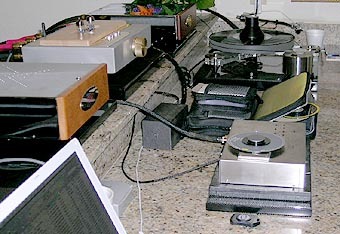 Not only did the Wavelength Cosecant USB DAC sound great but through the computer, it allows tremendous flexibility to tune your room in the digital realm, which is exactly how Gordon dialed in his space this year. Need to get rid of a bass boom? Zap! It's gone with the computer. Have a pesky treble peak? Zap! It's gone too - you now have total control over what you hear. It's flexible too: You can pop a disc in the computer transport for your musical thrills, or you can download and burn music to disc and play it. But there's more. Because of its USB protocol, there are no jitter problems as with most transport/DAC combinations. Jitter-based timing errors are a thing of the past with this thing. Okay, crystal ball time: This is the future of digital, brought to us by our very own Gordon Rankin at Wavelength Audio. This will be one of the hot new trends, and everyone is gonna have to hustle to catch up. 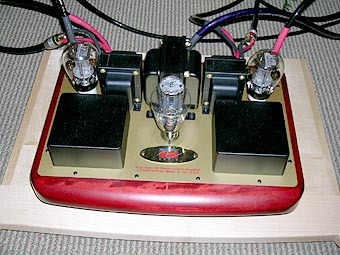 In addition to the Cosecant USB DAC, Gordon also had a selection of other fine front-end gear. 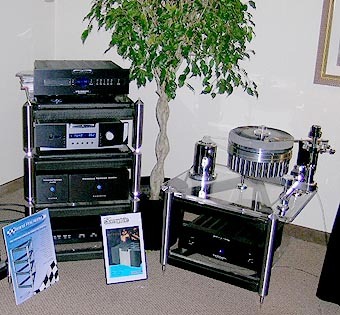 Analog duties were handled by the Tangent phono stage, a Clearaudio Solutions turntable, an SME 3009 R3 tonearm with a Shelter 501 cartridge and an RS Laboratories rotating headshell with custom Nirvana Audio SX interconnects throughout. As a second digital source, Gordon used a Tent Labs modified 47Labs Shigaraki and Wavelength Cosine DAC using the new ultra-low jitter Caffeine DAC module, passive I/V conversion, no filters, no up- or oversampling and a transformer-coupled tube output. 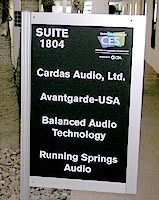 Gordon was using his new Signature Silver Cobalt 45 stereo amplifier ($25,000) to power the lovely Cain & Cain loudspeakers in what was one of the best-sounding rooms at CES. 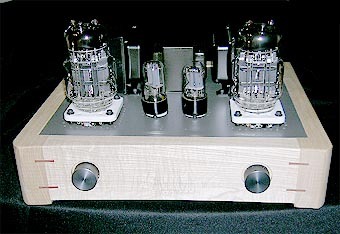 The attractive wooden chassis of the amp is, in fact, a cleverly machined synthetic resin that so resembles wood as to even duplicate intricate wood joinery where different sub-parts connect. Alas, this material can be specifically tuned for a given resonant frequency, something Gordon took advantage of to minimize chassis talk. One of my personal highlights of the show occurred in Gordon's room when Jazz and classical guitarist Don Better gave me an impromptu guitar lesson on a Telecaster plugged into a GAS Jr. Wavelength Guitar Engine that Gordon had stashed in the back room. Gordon's promised me the GAS Jr. for a review here at 6Moons. Here's a sneak peek: It's got killer tone! data, photographs and room information in one handy place. I can guarantee no one's going to toss these! The Almarro exhibit at T.H.E. Show was one of my favorite rooms. 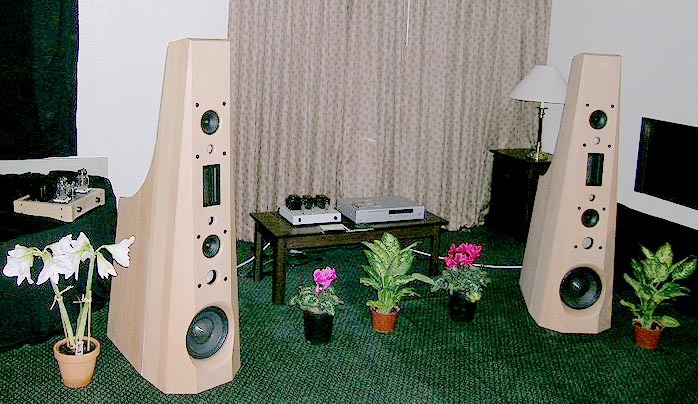 When I stopped in, their little entry-level $800 A205A amplifier [right] was mated with their top-of-the-line $4900 M50A loudspeaker [above] and playing music to excellent effect. 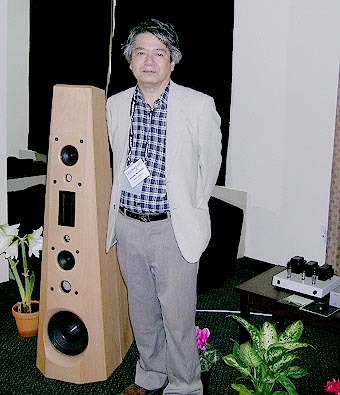 There are a lot of great Japanese products that no one has ever heard of in the USA - and the A205A amplifier is one of them. It's as plain-looking as vanilla yogurt and uses EL84 pentodes in single-ended fashion to produce music in a completely beguiling manner. I felt like Alice after stepping through the looking glass and being confronted with Wonderland. As such, I'm handing out my Alice in Wonderland Award for what was one of the best-sounding amps at T.H.E Show and a bargain to boot! 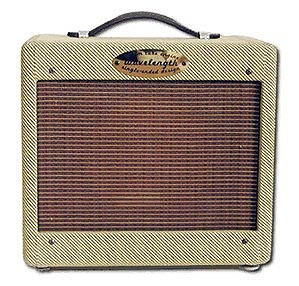 I'm definitely going to be pestering Almarro for a review of the A205A here at 6Moons, in hopes of bringing you the full story on this little wonder-amp. The A318A amplifier [right] was also on passive display. 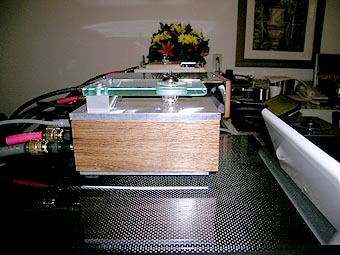 It is a $1500 6C33C-B single-ended design that I'd also like to review - pretty please? I've got lots more to tell you in my forthcoming coverage, so stay tuned for part 2!